The Galaxy Tab Gallery app enables you to look at or watch any pictures or videos you have taken with your Galaxy Tab camera or downloaded to the Gallery app. 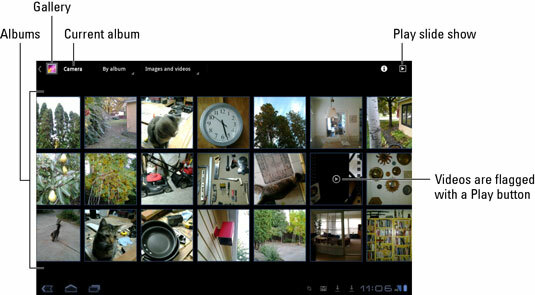 Touching an album in the Gallery app displays that album’s contents, pictures and videos, in a grid of thumbnail previews. Those previews give you an idea of what the images are. When a picture preview features a tiny Play button, then it’s a video. Otherwise, the thumbnails represent still images. You can view more images in the album by swiping your finger left and right. To view all the images in an album, touch the Slideshow button. 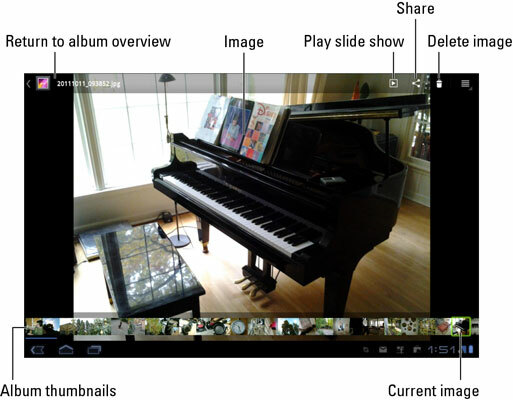 Playing a slide show turns the Galaxy Tab into a fancy, animated picture frame. To view an image or a video, open an album and then touch a thumbnail with your finger. Images appear full size on the screen. You can rotate the Tab horizontally (or vertically) to see the image in another orientation. Videos play when you choose them. To see the controls, touch the screen while the video is playing. To quickly find videos, choose the command Videos Only from the Content menu. 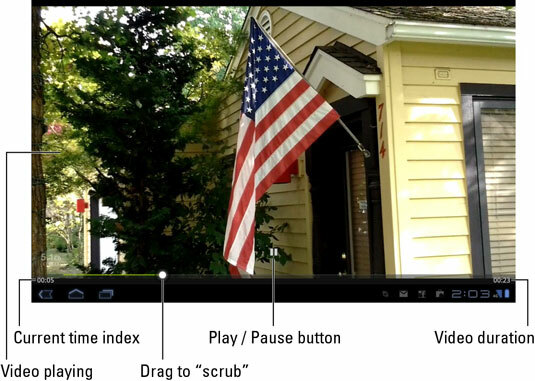 Touch a video or an image to redisplay the onscreen controls. To run a slide show of photos in an album, touch the Slideshow button. The slide show starts, displaying one image after another. For videos, only a freeze frame from the video appears. To stop the slide show, touch the screen.